When evaluating email service providers, marketers should also be evaluating the email reporting capabilities of the platform and how well it does—or doesn’t—meet their analytics needs. Analytics are necessary to measure the success of any email program that intends to grow ROI measured in dollars, impressions, reach, eyeballs and engagement. That is why evaluating the reporting suite of an ESP is critical. Email marketing has many unknowns that can have us travelling blindly, not sure of the path we’re on or even where we’re trying to go. Email analytics can change all that, by giving you insight into what is happening within your email marketing program and helping you find the right path. Marketers need to know who did what with your email and when to adjust, tweak, adapt, drop, capitalize on, and ultimately improve. Marketers are realizing that reporting insight is not only something they want, but have to have. That is one of the conclusions from our research based on data from our ESPinator tool. In response to the growing demand for better email reporting, ESPs are adding analytics to their line-ups or looking for third-party vendors to supply the capability. Take for instance the dashboard above, it shows when an audience interacts with their email. It could be over the entire account, a series of messages, or a single message. The X axis is time (Hour of the Day, Day of the Week). The Y axis is open rate (this could be anything – CTO, Click Rate, Conversions…). The size of the circle indicates sending volume for that time. You can see that that this client send most of their message during the middle of the day and Tuesday – Friday. Based on when their audience is interacting with their content, they should consider sending their email on Friday, Saturday, & Sunday – and between 4pm – 3am. That is clear within just looking at the dashboard. 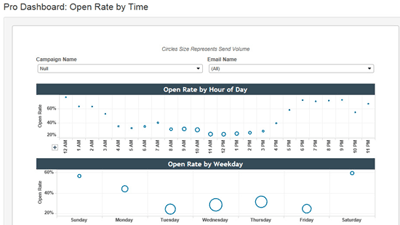 Klipfolio, DOMO, Tibco and Tableau Software re just a few of the options now that can be used to spot patterns in email performance data. The example above uses eMVision based on Tableau Software we used to develop it for ExactTarget/Salesforce Marketing Cloud and other ESPs. While email reporting is not new, there is an increased effort to make such tools easier to use. It is simply needed because of Cross-channel marketing and amounts of data companies can collect and attribute to their email marketing programs. I am definitely seeing easier-to-use versions of analytics suites hitting the market, including tools that are based on the easy visualization of data and let you drill down on email campaign analytics, like eMVision. However, that doesn’t mean marketers should choose email analytics based solely on ease-of-use. Everyone measures things differently, and what matters to one marketer isn’t necessarily useful to another. The analytics offered have to match up to the email marketing analytics needed to be useful. 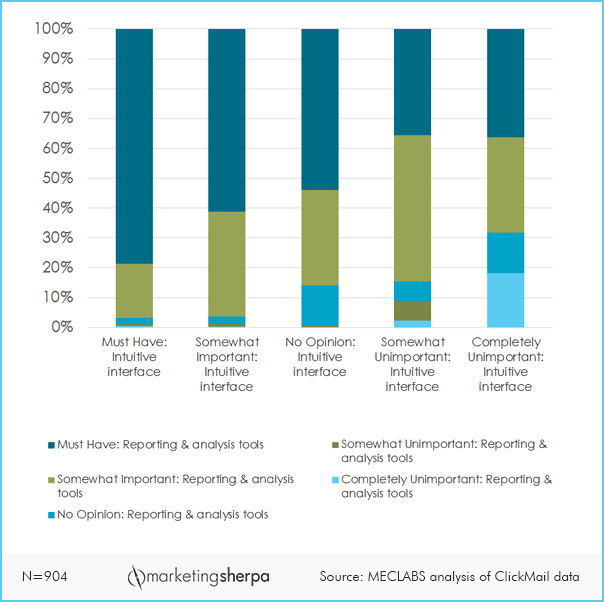 But even then, there’s a caveat to all of this: Making sure marketers can use the reporting. We all know the old saying, “Give a man a fish and he eats for a day. Teach a man to fish and he eats for a lifetime.” That wise saying is relevant to email reporting too. In our experience with email analytics, we’ve realized that—in general—email marketers don’t know how to effectively wield a large dataset. Email marketers don’t know how to put this data to use no matter how good it might be. Giving them email analytics tools without teaching them how to use those tools is akin to handing someone a fishing pole and not teaching them how to fish. They will likely figure something out, but they won’t necessarily use the tool to its fullest extent. b) teach marketers how to utilize them. We have realized that even the tool we built to be both powerful and easy—takes training in order to use it to its fullest extent, and we have started to put together a marketer’s email analytics user guide for it as a result. Think of it as a how-to manual for investigating and spotting critical patterns that can be acted upon to increase ROI. Sounds simple, right? If you ask nine top marketers what they should be analyzing in their email marketing program and why, you will get nine different answers. And with almost infinite possibilities to examine and measure, it is important that a sound methodology is used to achieve desired outcomes. Marketers who are evaluating ESPs and reporting capabilities must be mindful that usability should be part of email Marketing software comparison, not just the power. In addition to test driving the tools, they should ask a lot of questions about training and support to ensure they will learn to use all of the tool, not just the basics. On the industry side, as the analytics market grows and more ESPs and their partners offer enhanced email reporting capabilities, those of us who are building these tools should be aware of the usability and learning curve of our offerings. We can’t simply point users to a tool. We must make sure they know how to use it too, because all the data in the world is useless otherwise. Cameron Kane is the CTO at ClickMail, where his focus is customizing enterprise-level ESPs for clients. He has a thorough understanding of the most up-to-date technologies and how to use them to achieve clients’ business objectives. Prior to his position as CTO, Cameron ran Strategic Design Group, an agency he founded in 2001, which was acquired by ClickMail in 2011 when Cameron joined the executive team.